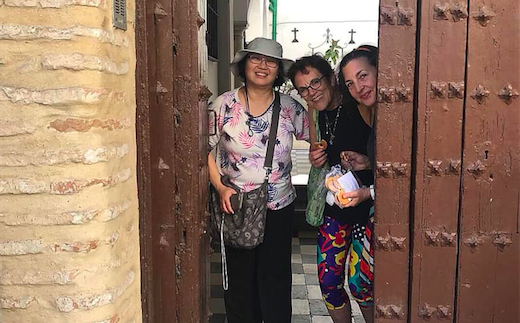 From Hong Kong to Arkansas to Arizona to California to Washington, all of the Flamenco Tour to Jerez participants have arrived. We celebrated with homemade dishes from Maribel, fresh tortilla de patatas from the take-out place down the street, and an assortment of tapas put together from the neighborhood market. 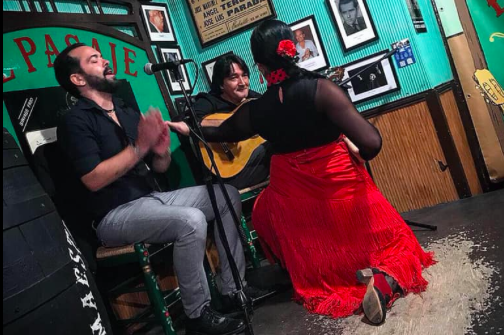 The Flamenco Tour has begun! 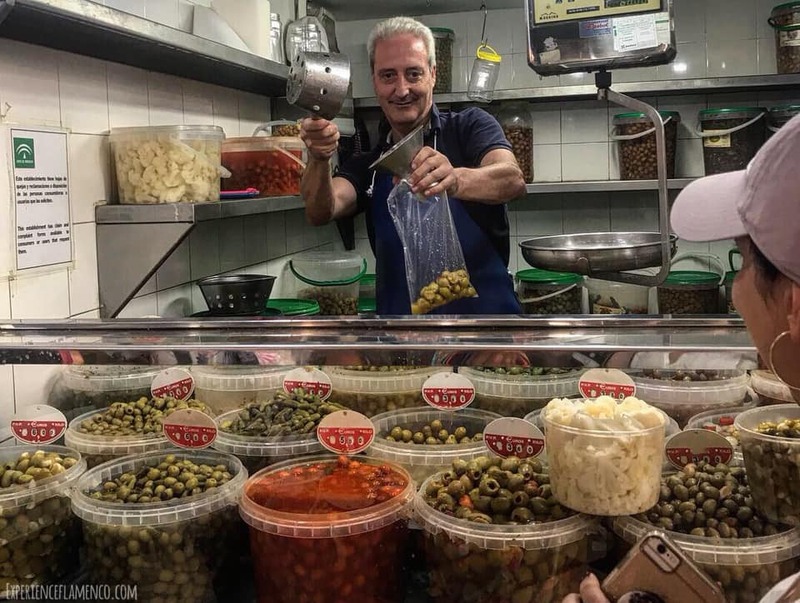 Fresh olives, bread, produce, fish, meat, nuts, eggs, you name it. 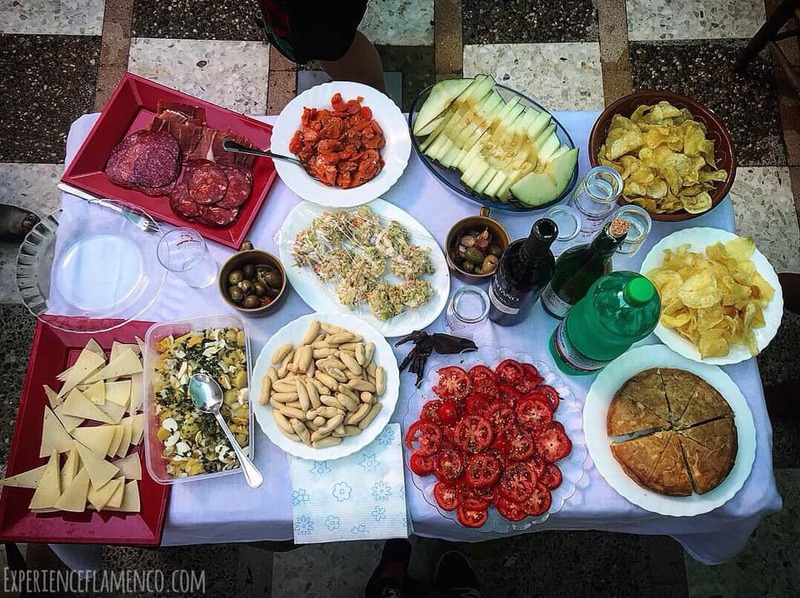 You can get it all at the Mercado de Abastos. We stopped by here on our “basic needs” walking tour before heading to class. Enjoying leftover tapas and the peaceful moonlit sky. 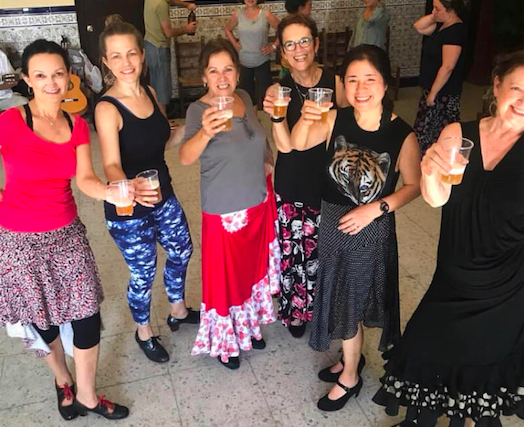 The ladies were offered beer on the first day of bulerías class. ¿Cómo puede ser? How can that be? We practiced entering and leaving with the cante one by one. Throughout the week we danced and danced as a group, in pairs and on our own. Olé. We’ve enjoyed a variety of shows at tabancos and peñas in town. I made sure to reserve us a table up from to see Fabiola Barba, Jaime Villar “Candié” & Augustin de la Fuente at Tabanco El Pasaje. Wow! What a performance! Fun is always guaranteed when visiting Fátima Canca. with Latin Grammy Nominated José Mijita & Carmen Herrera. So. Much. Fun. We “learned” two letras and practiced dancing responding to the changes. Cante with José Mijita, olé! Naturally we love enjoying meals together at the local restaurants. And Margaret came prepared with the first selfie stick the Flamenco Tour has ever seen. Unfortunately it broke toward the end of the week. I guess we overdid it. Juan Lara and Jesús de Rebeco at Peña La Bulería. When Momo (the sound tech and who you see doing palmas furthest to the right) saw the first member of our group arrive, he took her to a great spot to sit with a wonderful view of the performers. After the show we stayed and talked to him about bulerías and about the peña scene and how it has evolved over the years, how before women were not to go out of the house and sing but how that’s all changed now, and continues to change. BTW, a man came and gave us fans and happily informed us that this was the air conditioning of the peña, “Electric bills are high right now” he laughed and of course made us laugh too. A great place to go to clear your mind.